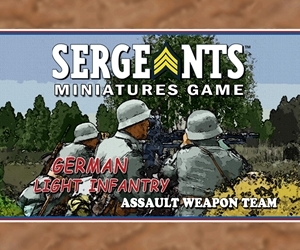 The German Light Infantry Assault Team brings all the tools necessary to get in close to assault an enemy position. The main assault force is one soldier armed with a MP40 sub-machine gun and one carrying a Mauser98 and a Panzerfaust for explosive firepower at short to medium range. Along with the long range fire support from two soldiers carrying Mauser98 rifles, this team is dynamic and effective.